What comes before the work? What do the artist and the curator say? The following is an ensemble of theoretical and descriptive fragments, poetry and documentation that deeper unfolds Julie Monot’s practice and latest work GREEN ROOM, curated by Elise Lammer for the research platform Alpina Huus, that was recently on view at Arsenic, Performing Arts Center in Lausanne. The quotes on theory are excerpts from German sociologist Georg Simmel’s 1909 essay Bridge and Door. Between January and September 2019, Arsenic, will regularly host exhibitions of visual artists concerned with the relationship between performance and domestic space. During this project, curated by Elise Lammer for Alpina Huus, the artists are invited to work across the various performance halls of Arsenic, challenging the notions of white cube and black box. The versatile aspect of a Green Room, which sits between the private and public realms, and the transitional quality of the colour is precisely what artist Julie Monot (born 1978 in Lausanne, where she lives and works) explores in GREEN ROOM, her first institutional exhibition in Switzerland. Transition sits in every element of the project, for which she produced over 15 anthropomorphic sculptures, as well as a series of scenographic devices. 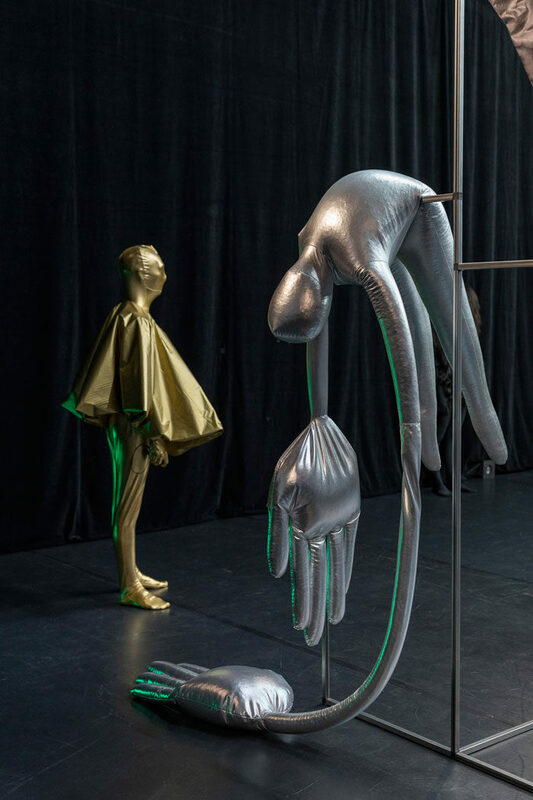 For Monot, transition is often a synonym of transformation, a topic she’s been exploring through numerous installations, videos and performances since 2013. 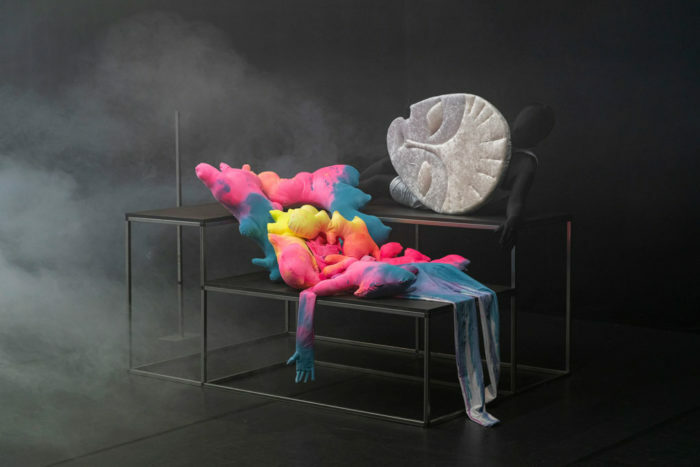 Julie Monot graduated with a Bachelor of Visual Arts from HEAD Geneva, and is currently studying at ECAL in Lausanne. She works across various mediums, such as performance, video, photography or installation. Her work focuses on the limits of corporeal externality and its modes of representation, among other things. Her appeal for transformation is rooted within her previous professional career as a makeup artist, and her experience in the field of the living arts. It’s hard to trace the origins of a Green Room, a term defined in traditional Anglo-Saxon theatre as a dressing room for artists; a place to wait before entering the stage. If Teatro Real’s Salón Verde in Madrid is predominantly green, it’s not always the case with the modern versions of this waiting room, which often keep from the color only the name. In cinema, for example, the color green is often used as a background, by means of a screen used to easily merge two sources of video together in post-production. In the editing process, green—which differs the most from human skin—can easily be removed and replaced with a new background. 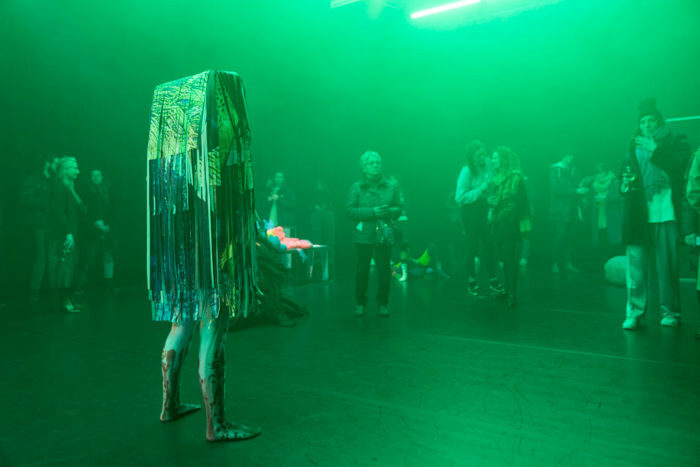 In GREEN ROOM, her most ambitious project to date, transformation starts on the opening night, with a 4-hour performance during which each artwork is brought to life by performers, and by means of a sequence of lights and smoke effects. The artist has developed a light pattern that evolves from white fluorescent light, typical of a contemporary exhibition space, to a more dramatic, cinematic green over the course of a 20-minute cycle. As a result, the green light dramatically affects the perception of colors, visually transforming all the elements and characters of the exhibition. From a psychological perspective, it’s been observed that green light can enhance concentration and tends to create a state of alertness. On the other hand, an over exposure to white fluorescent light—the most common light source within corporate environments—can induce stress and paranoia. 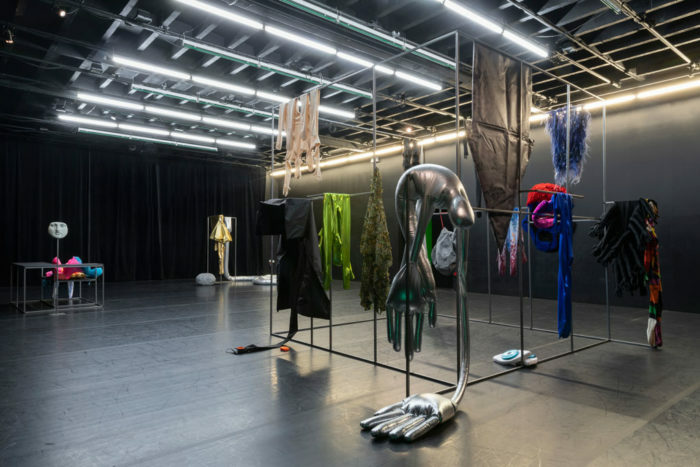 At the end of the 4-hour performance, everything is back into place, and yet each sculpture carries the invisible traces of its recent activation, giving its final form to the exhibition. 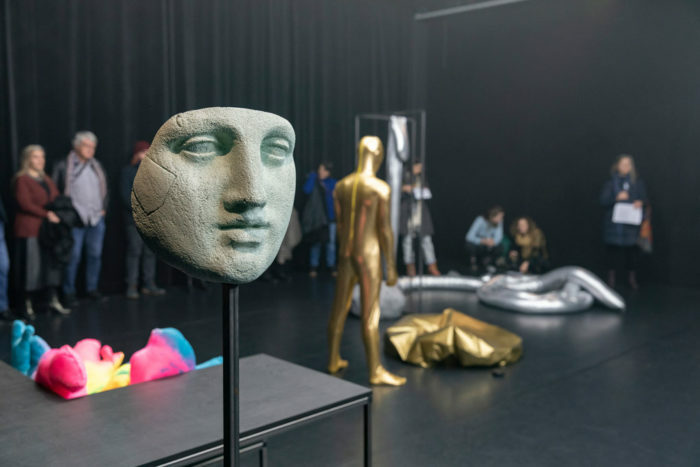 After the opening night, the sculptures will then be activated again during the following week, this time without announcement, during the following week, creating unexpected overlaps with other programmed performances and the daily life of the art center. 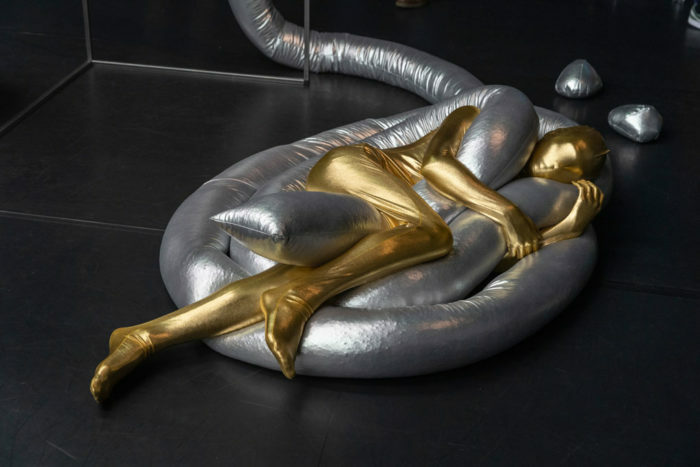 Forming a retrospective constellation, the 17 sculptures all emerge from Monot’s eclectic repertoire and biography, with quotes taken from modern art history, Pop music, classical literature, and fashion, to name only but a few. Not without humour, high and low cultures are merged together, contributing to a non-hierarchical vision of collective memory. When the experience is immersive and therapeutic, visiting a museum can be a self-optimizing activity. Can the museum activate a sense of communal purpose?